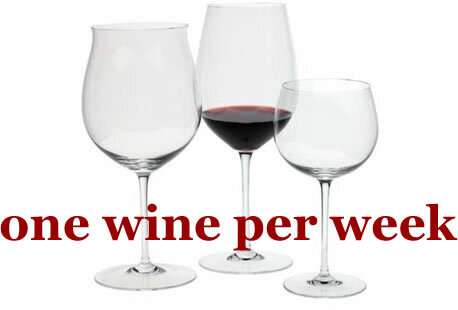 One Wine Per Week: WBW #42 - A $14 Barolo? This is my initial participation in Wine Blogging Wednesday, and what a challenge for the first one: Andrew over at Spittoon was in charge of this 42nd WBW and specified an Italian red wine to sample and review. Easy enough, but he also specified the review be in 7 words. That's more difficult than trying to write a review in Haiku. 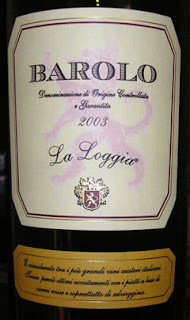 My WBW submission is a 2003 Barolo from La Loggia, which I purchased at Trader Joe's for $13.99. A Barolo for $13.99?? I found out about this via a post on the Chowhound Wine Board and decided to take the plunge. Deceptive tannins turned my mouth inside out. Based on what I've read, the characteristics of this wine weren't particularly Barolo-like but I have nothing to compare it to from personal experience. On the basis of judging it as a wine and not knowing what kind it was, however, I would give it two thumbs up. GREAT JOB. And welcome to WBW. After the Chowhound posts, there wasn't a bottle to be had at the Rosemead TJ. Will have to look for it again--and maybe decant it? We cannot buy wine in our TJs here in Taxachussetts. Just as we were moving in, November 2006, there was an initiative on the ballots to allow grocery stores to sell wine. We were excited until it got shot down. I’d love to get a good Barolo for that price. The only one I’ve tried was $39.00…mmmmm! It was goooood.